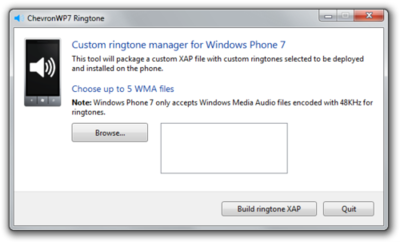 Just days after the release of ChevronWP7, it looks like we now have the first homebrew application in the form of a custom ringtone manager. The application has two components, one being a desktop application and the other being an XAP app that needs to be deployed to your Windows Phone 7 device. You can add up to 5 WMA files encoded at 48KHz. It’s good to see it is now possible to do this. I can’t help but think what a crazy situation it is that you have to jailbreak your phone (voiding the warranty) just to add a custom ringtone. Microsoft, if you want to sell phones, just let go of your desire to control the ringtone market. It is not worth your while to make it this hard.